In this very short review, I look at management options problems on past quizzes, exploring different ways in which these problems have been written, and the different ways of solving for them. In this very short review session. I'd like to take a look at the management options problems that you've had on quiz. And take a look at the very different kinds of ways in which this problem can be presented broadly speaking goes what you're trying to do when you have options on standing in a company that had been granted to managers your value Pichette as a stockholder decreases because you given away a slice of the equity. The question is how do you incorporate that lost value in your value project. So I take it back a few quizzes and give you a problem which kind of gives you both ways of dealing with management options. So this particular problem you're asked to review the valuation of shares in the company the analyst has estimated an intrinsic value per share of a dollars but he screwed up in years. Where he screwed up he got the intrinsic value by taking the intrinsic value of equity and dividing by the total number of shares including the options Hudson and the fully diluted which is not the right thing to do because that unit you're ignoring the value valid the options you exit you're doing all kinds of things you shouldn't be doing. You're told that the company is 100 million shares outstanding 25 million options and you're also told the exercise press another way. 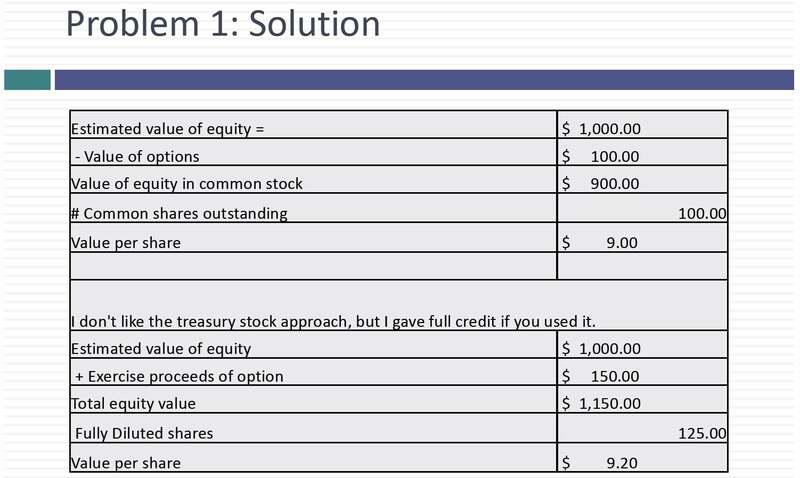 If you had to exercise these options this is what you'd have to pay the company six dollars per share and the value per option is for when you value option. Remember use an option price [inaudible] time premium. Very different perspective on options. It asks you to estimate the correct value of equity per share and this was an unusual Prob because you could have sorted it both ways. What are the two ways. There are two ways of dealing with options. The first is to do attract what is and what is doing the drive involved. Start with the intrinsic value of equity which in this case will be the eight dollars per share that's 125 [inaudible] and is screwed up and multiply and divide by 125 so you get a billion dollars is your value about what you subtract out the value of the options. Remember you're 25 and in options four dollars per option. That's 100 million you get a value back. The common stock of 900. Divide that 9 million by just the outstanding shares don't bring in the Options 100 million shares. You get a value per share of nine dollars. That in my view is the right way to do this. This from though you could have done it using the treasury stock. What's the Treasury stroke approaches what do you do. You start with a billion dollars an intrinsic value for equity. You add to that the proceeds you would get if the options got exercised today which is six dollars the exercise price dumps votes as 150 you get 1000 150 then you divide not by the 100 million actual shares but by the fully diluted 125 million shares you get about a share of nine dollars and 20 cents using the two approaches. Give me different answers of course they do. The Treasury's stock approach ignores the time premium and the option you're on developing the option that gives you a higher price. But in this particular promp because you could do both. I'd given you full credit for either answer. Now most problems and quizzes we have a management option. I give you just enough information to do one or the other. So check the process. If I give it up give the new the option value. I want you to use the first approach if I've given you the exercise price new option and I don't give enough information to value the option used the Treasury's stock approach. Given enough information as you were in this quiz then you have a freebie you can use either approach. Don't mix them up. In other words don't subtract out the value options and to buy about 125 million shares. That's a no no don't add the value of the X's don't add the exercise Brautigan just divide by the 100 billion. So make sure you pick your pad and stick with it because if you mix the parts up all will all hell will break loose. It's like a second problem and this was a really messy. What did your friend that people had trouble with this from as he walked this particular prob yours would you give it your given that the company had a hundred million shares trading at nine dollars per share 300 million.